We can't wait to meet you for our next Code.org Fundamentals Deep Dive workshop. Please note this workshop is meant for teachers with experience teaching the Code.org Fundamentals curriculum and/or teachers who have attended the introductory workshop in the past. Please bring your laptop, charging cord, and a writing utensil. Breakfast and lunch will be provided. Before joining Code.org, Mike taught elementary and middle school computer science classes in a district outside of Portland, Maine. His students discovered an excitement for technology through lessons in robotics, game design, 3d printing, and physical computing. He has also facilitated professional development for CS Fundamentals and CS Discoveries. 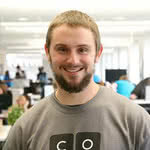 At Code.org, Mike works with the education team to develop curriculum for elementary students. Please bring your laptop, charging cord, and a writing utensil to the workshop. Breakfast and lunch will be provided. Educate Maine has issued our Request for Proposals. Do you want to present at this year's Symposium? Submit your presentation idea today.